At LSBU we believe that practical experience is a vital component of learning, and wherever possible we aim to ensure students have the chance to practice their skills in a professional, real setting. Doing so not only helps them hone their craft, but it also provides opportunities to develop outstanding CVs and a professional network that can make all the difference when it comes to starting a career. That’s why, since 2009, BA (Hons) Drama and Performance students have had the chance to join our Student Theatre Company, giving them the chance to network with professional directors, performance and theatre companies as they create professional-standard performances of new and existing works. It’s a far cry from the company’s first year, which saw those 15 students stage a production of Federico Garcia Lorca’s Blood Wedding. However, even in those embryonic stages, professional collaboration was at the very heart of the student theatre company. It's intense, it's thrilling and very rewarding to see the hard work done in rehearsals come to life on stage in front of an open audience. It’s a collaboration that has borne fruit for all the students who have been involved in the performances over the years, as Gill is quick to point out. “The company always plays to sold-out houses, with over 600 people seeing the students’ work each year,” she says. The company already has plenty of success stories, with every company member leaving LSBU with professional work on their CV and portfolio. For some, their time in the company working alongside professionals leads to early offers of employment. In 2012, for example, Maria Klockare worked as Assistant Director to Moving Stories’ Artistic Director Emma Gersch on her production of The Caucasian Chalk Circle. Emma was so impressed with Maria that she offered her work as Assistant Producer on her next show at the Riverside Studios. In 2014 another student, Ed Richards, travelled to Au Brana theatre workshop in Toulouse, France, as part of an annual artistic residency. His work so impressed the company that he was invited to return in 2015 and has now been offered a place in the permanent acting company. Current members are equally effusive in their praise for the company. Mathieu Lovelace spent a season working in the company while still a student, before securing an graduate internship as Assistant Director. 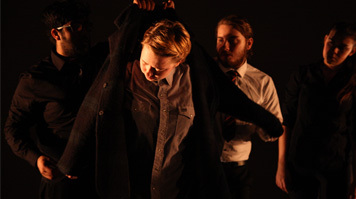 “Working as part of the student theatre company is essentially a unique taste of what a professional theatre company's daily life is,” he says of the experience. "There's the opportunity to learn a lot - about your craft, yourself, and yourself in relation to the other members of the cast and crew, who soon become your second family." Those success stories are what it’s all about for Gill, who takes great pleasure in seeing course alumni go on to establish themselves as artists and performers in their own right. “As the Artistic Director, it’s always exciting to watch our students presenting themselves as early career artists,” she says. It’s an absolute pleasure to watch students grow and develop into skilled, creative and intellectually curious young performers and theatre makers.